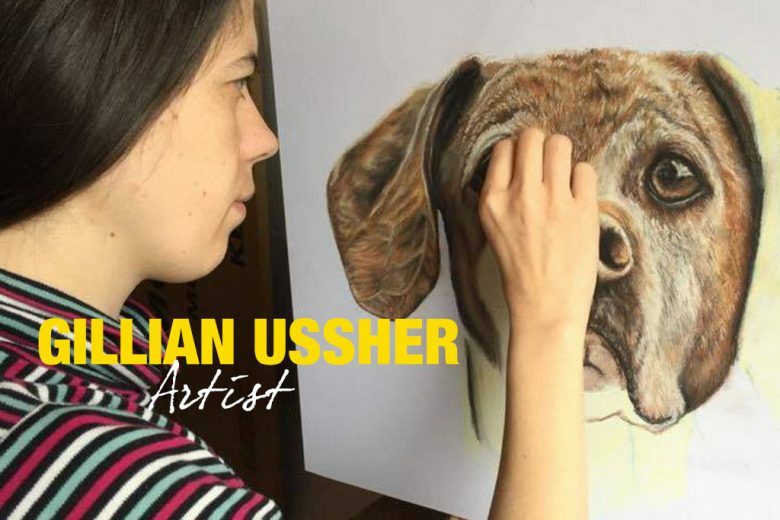 Read how mum Gillian Ussher turned her passion for art into a thriving business drawing pet portraits – and enabled her husband to give up his job and work from home. I worked in administration, in an office. I have a biology degree too, so nothing remotely to do with art! How long have you loved art? The first painting that I really noticed was a painting of three famous racehorses, We Three Kings by Susan Crawford. A print of it was hanging in a hotel I visited with my family when I was about six years old and I just remember staring at it for hours on end. I was infatuated with horses, and it seemed to capture them in a way that a photograph couldn’t, showing their different personalities, it was the most magical thing I had ever seen. From then on I just drew obsessively, collected art books and visited galleries whenever possible. My grandfather was equally obsessed with both horses and art so I had a lot of encouragement from him and he introduced me to a lot of new artists. When did you first realise you could make a career out of your artistic talent? I had a very short maternity leave when my daughter was born as we had just moved to the UK from Ireland, so she was ten weeks old when I had to go back to work. I remember bringing her tiny little vests into work with me to smell them when nobody was looking, and crying in the bathroom because I missed her so much. It was absolutely awful. I decided that I needed to set up a business from home, but had no idea what type of business it would be! My husband suggested art and I was really doubtful that it would be possible to earn any money from it, but we looked up other artists online and were surprised by how many were out there so I just decided to go for it and launched Perpetual Portraits. It was taking a huge chance, but I couldn’t face being away from my two children all day any longer! When and why did you decide to focus on pet portraits? As nobody had heard of me before and I didn’t have money to invest into an exhibition, I knew my only chance to earn money was by taking commissions. 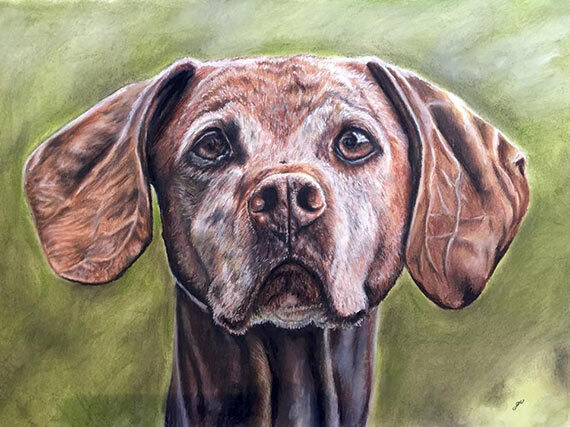 I already knew how popular pet portraits were -everyone I know who has a dog seems to have a portrait. Also I had always drawn and painted animals, especially horses and dogs, so it was something I had a lot of practice in and was quite fast at. I did get a shock when I realised what a saturated market it was, but I hoped that that meant there was a huge demand for it, and with lots of practice and realistic pricing I might earn enough to replace my administration job income. How is your business going so far? I started in March 2013 and that first year was quite slow. I spent much of 2014 studying marketing and social media and that has really paid off. Since the beginning of this year it has been going incredibly well, much better than I could have hoped. I’ve started work on some online tutorials and other projects so lots more to come in the future! I’m the kind of person who celebrates my dogs’ and cat’s birthdays with a full blown party, keeps photo albums dedicated solely to my pets and bores people to tears with stories about them, so I love when I get a like minded customer, and most of them are! I think my ideal customer is one who chooses reference photos for me to work from, which really capture their pet’s personality. This goes a long way towards helping me produce a portrait which they will cherish, and for me that is the most important part of it. How do you reach out to your target audience? Luckily and crucially, when I started I had the good fortune to come across Paula Hutchings from Marketing Vision, and she taught me how to identify my target market which helped to make so much sense of everything! I reach them mostly through social media, Facebook in particular. To start with when I had absolutely no audience or budget, I donated art and commissions to various charities that I genuinely cared about to get my name out there as much as possible. I’ve held competitions on my Facebook page too, to encourage shares and draw attention, and from this year it has been feasible to start experimenting with Facebook ads which have had a big impact. I’ve also contacted magazines and publications to offer a portrait commission as a prize for any competitions they may be running. I have taken out paid advertising in magazines on rare occasions as well. This year I also started working with a re-seller, Pawfect Petwear, run by another entrepreneurial mum, so they have taken on a lot of the marketing and are doing fantastically. Business has been going so well that my husband has been able to give up his job and work part time from home which has made it possible to grow the business. My studio is in our spare room, so I work there from very early in the morning, then take a break when I hear my kids getting up to do breakfast etc, and my husband will work during those hours. We home educate our seven year old son, so that takes up most of the morning, then my husband will take over after lunch and I’ll work for the afternoon and early evening. I always try to finish at around six o’clock to make sure we have the evening together as a family, so if there’s anything I need to finish urgently I’ll do it late in the night. I try to keep weekends free, but it’s not always possible. Both of my kids have chickenpox at the moment for example, so our routine is out the window! I have to work weekends to make up for hours I have missed, which allows me to spend an entire midweek day cuddling them on the sofa while they are ill without feeling guilty! 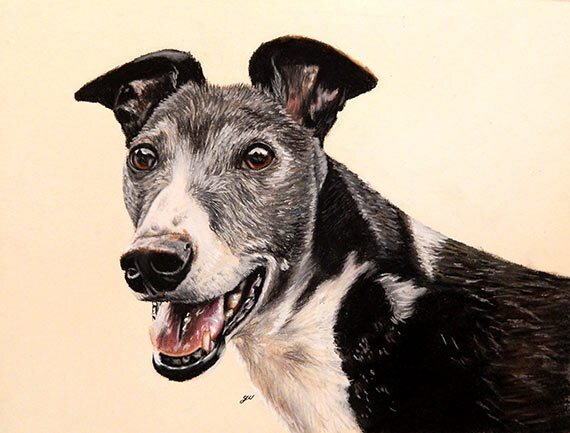 What’s been your favourite pet portrait? The first paid commission I ever had is still my favourite. I had left my job two weeks beforehand and was feeling really nervous and beginning to think I had taken too big of a risk, when the phone rang and it was a customer. I remember mouthing ‘It’s an order!’ to my husband while I was still on the phone to her, it was so exciting. It was such a great reference photo, a gorgeous little terrier called Ruby and a really lovely customer who was delighted with the finished portrait. I think I spent the entire price of the portrait on ice cream and wine to celebrate! What tips do you have for other mums who’d love to turn their talent into a business? I think marketing was so crucial for me, that if you have any budget at all to get some help with marketing. In my case, it saved an absolute fortune in advertising and paid off at least tenfold. There are also lots of free resources online which have great content on marketing and specifically social media marketing. Also maybe don’t give up work so early and plunge right into it as I did, it’s a wonder I didn’t suffer a heart attack during the first two years! You can see more of Gillian’s portraits and book your own on her website, Perpetual Portraits.